Two wastewater overflow incidents occurred within days of each other in Kihei. The first incident was reported at 7 p.m. Friday, May 15, 2009, when a 52 gallons wastewater overflow was discovered coming from a sewer manhole on Alena Place.Â The overflow was caused by grease in the mainline.Â Authorities say the spill entered a storm drain, but he drain was blocked by debris, and no wastewater reached the ocean.Â The line was cleared, standing water was removed from the roadway and storm drain and the spill site was disinfected. In the second incident, the County of Maui Department of Environmental Management reported that an overflow of approximately 3,985 gallons of semi-treated wastewater was discovered at 6:00 a.m. on Sunday, May 17, 2009 in Kihei. 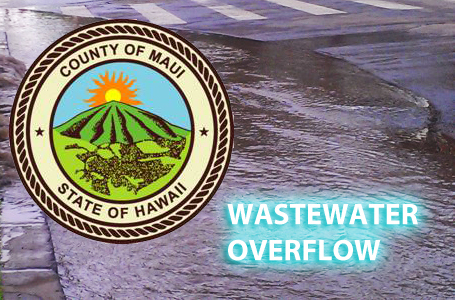 The overflow was caused by pump failure at the Kihei Wastewater Reclamation Facility and was stopped by 6:45 a.m. Â Wastewater flowed down the driveway of the facility and into a storm drain on Welakahao Road. The storm drain has no outlet to the ocean. The spill site was disinfected. In both incidents, the Department of Health was notified.